Ok! Now hold tight because I have another great game for you guys and this is Royal Blood by GAMEVIL. This is another great RPG game for mobile devices. 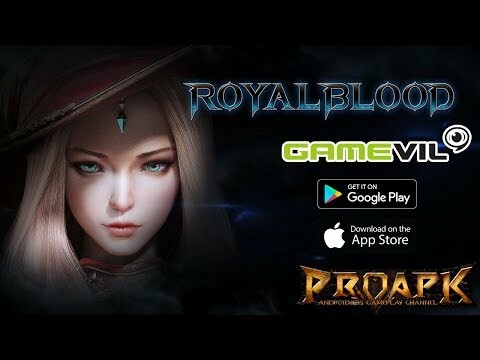 Royal blood is the next generation of mobile MMORPG gaming where you will be able to experience PC level thrilling RPG battles on your mobile phone. The game is taking off soon finally after being in development for more than two years. Royal Blood is an open field MMO role-playing game that’s all about reclaiming what’s yours. Here, in this game, you will be able to experience the thrill of some epic 70 vs 70 battles in a vast open world. One feature that people are waiting for the most is the live event integration where people can seamlessly join quests with other players. The game provides hundreds of quests and integrates live events to provide the gamers with cooperative and engaging gameplay. Unlike the traditional MMO role-playing games where players follow a static quest line, in Royal Blood, you will complete event driven quests that may appear in the battle arena at any time. Clearing these quests and completing the missions will subsequently lead you to next levels, where you will be able to unlock new battle arenas. And now let`s see what the gameplay has for us. The game has four main classes in the game; Warriors; to charge and defend, Ranger for the Dual Pistol Wield, and Crossbow, Mage with the Flame and Frost ability, and lastlyBard for the melodic Destruction and Blessed Song. The game enables various types of play styles, so you can choose your fighting style anytime. Annihilate the forces of evil with your epic skill set. Open up your combat possibilities. Unleash your class specific attacks on your enemy and wreck them. Each character has a special skill such as the Warrior can use his strength and health to take the front line in battles, whereas the archer can skillfully wield ranged weapons, to rapidly hunt down the enemies. Enjoy the intense battles in various game modes ranging from PvP to raid battles. In the 3v3 battle arena, you will get a chance to prove your strengths. Plan your ultimate strategy as you team up with different players worldwide. What makes the game even funnier is that there’s a plenty of exclusive lifestyle content in the game as well that you can enjoy. Fish, collect, and mine to gather various materials, and collect useful items such as potions and food! Each win will earn you Lord Points what will let you earn some rare items.